In November 2016, James (Jimmy) Pasakos presented new works in a solo exhibition at Tacit Contemporary Art Gallery, Melbourne. 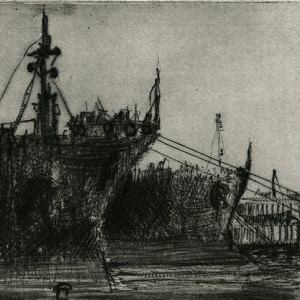 The works consisted of dry-point and monotype prints. The overall theme of the exhibition saw Pasakos revisit his core work of the Melbourne Docklands and its surrounding areas. A passionate theme for the artist, he has developed works of this nature over many years. The theme continuously informs Pasakos’ identity while simultaneously presenting new narratives to explore. 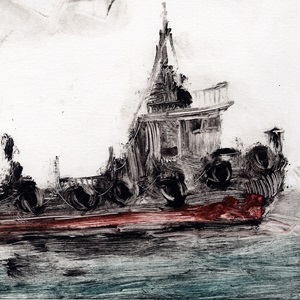 Above: Tugboat (2014) detail, Monotype, 13.5 x 22cm, 1/1. 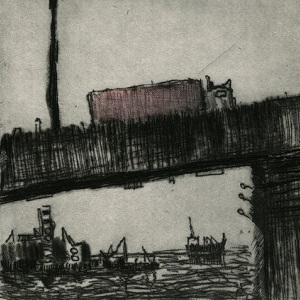 Above: Overpass I (2016) detail, Dry-point, 20 x 15cm. Above: Docked (2016) detail, Dry-point, 20 x 15cm.